Pakistan is a vitally important country in the contemporary global political system. It is a de facto nuclear state, and a pivotal country in the War on Terror. 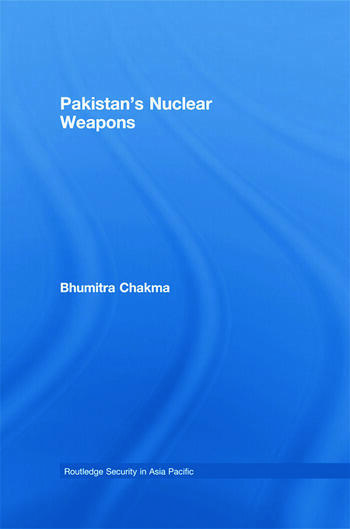 This book provides a comprehensive study of a nuclear-armed Pakistan, investigating the implications of its emergence as a nuclear weapons state. Setting out the historical background of Pakistani nuclear development, the book examines the lessons for proliferation that can be drawn from the Pakistan case. It explains the changes and continuities of Pakistan’s nuclear policy, assessing its emerging force posture and the implications for Pakistani, South Asian and global security. It also considers the extent to which Pakistan can be said to have a nuclear doctrine, the Pakistani nuclear command and control system, and the relationship between Pakistan and the Non-Proliferation regime. Addressing the issue of whether Pakistan should be viewed as a proliferator, and the implications of a nuclear Pakistan for global terrorism, Pakistan’s Nuclear Weapons is an important study of all the major issues surrounding Pakistan’s emergence as a nuclear power. Bhumitra Chakma lectures in War and Security Studies in the Department of Politics and International Studies at the University of Hull. He specialises in South Asian and global nuclear politics and ethnicity and nationalism studies. He is the author of Strategic Dynamics and Nuclear Weapons Proliferation in South Asia (2004), and has published widely in international journals, such as Modern Asian Studies, Asian Security, Asian Survey, Identity, Culture and Politics: an afro-asian dialogue etc.